'S e dùthaich ann an Aimearaga Mheadhanach a tha ann an El Salbhador, "[Tìr] an t-Slànaigheir". Tha i na laighe eadar Guatamala agus Hondùras air a' Chuan Sèimh. 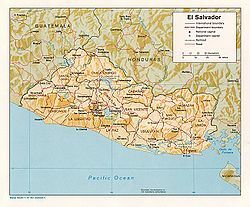 Thàinig an t-ainm bhon fhacal Spàinnteach:El Salvador ('sa Bheurla: "The Savior") airson urram a chur air Iosa Chrìosd. Air a tharraing à "https://gd.wikipedia.org/w/index.php?title=El_Salbhador&oldid=500691"
Chaidh an duilleag seo a mhùthadh 22 dhen Iuchar 2015 aig 21:30 turas mu dheireadh.